Polish Prime Minister Beata Szydło. Source: PAP. If you follow international news about Poland, you’d be forgiven for thinking that the country’s politics consist exclusively of an authoritarian government – intent on silencing critics, bringing state institutions under party control, destroying the environment, denying women their rights, and leading the country into conflict with its European partners – facing off against mass street protests in defence of democracy. While serious struggles over such issues are taking place, and rightly receive attention, a vital part of the story has got lost in this coverage: despite the occasional photogenic street protest, the government is extremely popular. 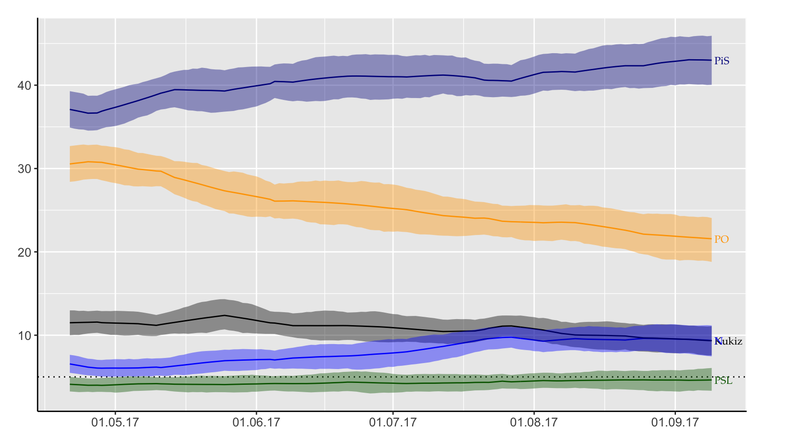 The ruling Law and Justice (PiS) party’s poll numbers are currently at their highest level since it returned to power almost two years ago. At around 40%, its support is equal to the next three parties combined. This fact is rarely explained in international coverage, and often not even mentioned. A report this week in USA Today cited two polls that are six months out of date to falsely suggest that PiS’s support is low and declining while the opposition is on the up. Another recent piece by two social scientists for Democratic Audit acknowledged that PiS is popular ‘despite its anti-democratic agenda’. It then listed in detail the government’s attacks on the judiciary, public media, the Constitutional Tribunal and so on, but failed to mention a single positive policy that might actually account for its high level of support. The story that is being missed is an extremely important one, in both a domestic and international context. PiS’s popularity hinges upon the enormously successful economic and social policies it has overseen. When the party came to power, I published a post on this blog heralding the arrival of a new left-wing government. Although written with tongue in cheek, the point I was making was serious: while PiS has been cast as a right-wing party, based on its nationalist tendencies, cultural conservativism and religious values, in economic terms its agenda is decidedly left wing (more so, in fact, than any party in this or the previous parliament, including the post-communist Democratic Left Alliance, SLD). In the two years since I wrote that piece, the government has set about implementing that agenda. The centrepiece has been a new child-benefit programme that is, in relative terms, one of the most generous in Europe. Official data show that in 2016, the year it was introduced, the proportion of children living in extreme poverty fell by one-third, from 9% to 6%. Given that the payments only began in May that year, 2017 should see the figure fall further. Far from being spent on frivolous luxuries (or alcohol and cigarettes, as snooty critics warned), the money has overwhelmingly been used by parents for necessities like food, clothing, school fees and other forms of educational activity. Record numbers of families have been able to take their children on holiday, many for the first time. The domestic tourism industry, as well as the retail sector, has been given a huge boost in the process. There is also no evidence that, as many feared, the new benefit would lead many women to give up work. Meanwhile, the government has more than doubled the threshold at which income tax starts to be paid, from a miserly 3,000 zloty under the previous government to 8,000 zloty. The minimum wage was raised by 8% at the start of this year and will go up another 5% in January. PiS intends to shift from an insurance-based to a universal system of healthcare, meaning workers on so-called ‘junk contracts’ will no longer be denied certain forms of treatment. It plans to raise the health budget from 4.4% of GDP to 6% by 2025 and has introduced free medicine for the elderly. A programme was launched last year to create new stocks of affordable housing on state-owned land intended primarily for poor families who, after paying rent over a period of time, will take ownership of the property. These policies have, unsurprisingly, been enormously popular. One of the main reasons PiS swept to power in 2015, winning an unprecedented parliamentary majority as well as the presidency, was its promise to help those who felt that, despite all the talk of Poland’s economic miracle, they had not benefited. Now, half of Poles say they are optimistic about the country’s economic situation – the highest level since the question started to be asked in 1989. More than three-quarters (77%) approve of the child-benefit scheme, and there is particularly strong support for the government’s family policies among those who hold left-wing views. Even more impressive, while many warned that PiS’s campaign promises would be unaffordable, so far there has been no sign of such concerns being borne out. Indeed, the government has overseen continued growth and a manageable deficit. Moody’s, for example, changed its outlook for Poland to negative after PiS came to power, citing ‘risks related to a substantial increase in [government] expenditures’. However, this year it shifted back to a stable outlook and, last month, published a huge positive revision of its forecasts for Poland’s economy, predicting GDP growth of 4.3% this year (up from a previous forecast of 3.2%) and a fiscal deficit of 2.5% of GDP (down from 2.9%). The latter figure is in large part a consequence of the government’s dramatic success in increasing tax revenue. This has been achieved not by raising rates or introducing new levies, but through a ‘spectacular’ improvement in collection, especially a clampdown on fraud that has raised the VAT take by 23.5%. The draft budget for 2018 foresees further improvements in tax revenue. Meanwhile, unemployment continues to fall to record lows and wages are rising. Both, it should be noted, are trends that started before PiS came to power and also owe much to Poland’s terrible demographic situation. But the current government has also overseen one of the biggest waves of immigration in modern European history, as over a million Ukrainians have been welcomed to Poland and, aided by a similar language and culture, have quickly integrated themselves into the labour market. Poland also continues to be a European leader in attracting foreign investment. Daimler this summer broke ground on a new €500m euro engine plant, while JP Morgan has picked Warsaw as the location for its new global operations centre. The economy minister is confident of attracting tens of thousands more financial-services jobs from London post-Brexit, and has been wooing investors in the US. A record number of firms were founded with foreign investment in the first quarter of this year. There are some possible clouds on the horizon. Tensions remain between the ‘Poland first’ economic nationalism of hardline figures in PiS and the openness of its more moderate, business-friendly types. A looming conflict this autumn over the ‘repolonisation’ of foreign-owned media firms, a policy driven by ideology and politics rather than economics, will spark outcry from American and German investors (along with further domestic protests and censure from the EU). The government’s decision to lower the retirement age, while extremely popular, will be a huge and growing drain on the public finances. As social spending continues to run up, low-hanging fruit like tackling VAT fraud are exhausted, and growth inevitably falters at some stage, a crunch will come when tougher trade-offs need to be made between raising taxes and reducing expenditure. But, for the time being, PiS has convincingly confounded those in the domestic opposition and international institutions who confidently predicted economic disaster. This is a story that should be of interest not just in the Polish context but also more broadly. Left-wing politicians elsewhere, if they look beyond their distaste for PiS’s ultraconservatism and militaristic foreign policy, will see an economic programme that has redistributed wealth while keeping the deficit in check and maintaining strong growth and investment. PiS’s dominance is helped by the ineptitude of the opposition, yet that in itself is a function of the government’s success. Other parties face an unenviable choice between criticising popular social policies (as the liberal Nowoczesna has done, leaving it polling in the single figures) or risking redundancy by mimicking them (as centrist Platforma Obywatelska has tried, with no success). Why, then, has the economic aspect been largely absent from the huge amount of international coverage Poland has received in the last two years? In part, no doubt, because of the general nature of the media: negative stories attract more attention than positive ones; economic news is less interesting and accessible than tales of EU rule-breaking, attacks on women’s rights, and so on; the media likes a nice, simple narrative. But there are also perhaps more specific biases at play. Western mainstream media are almost universally hostile to PiS, and have little interest in giving them credit for their economic achievements. One also senses a subconscious difficultly for western editors, journalists and audiences to break out of their view of politics as a single scale with a ‘right’ that is culturally conservative and economically laissez faire against a ‘left’ that is culturally liberal and economically interventionist. PiS, which culturally would find itself somewhere on the right fringe of the US Republic Party but is economically to the left of most Democrats, does not fit comfortably into this mental framework. It has been easier for western media to simply brand it (misleadingly) as ‘right-wing’ without thinking more deeply. Yet, as we’ve seen above, the Polish government’s economic success, founded on what are essentially social-democratic principles, is an integral part of the story. Acknowledging this is not to endorse the government’s other actions; indeed, it is a vital part of understanding why it has been able to pursue those illiberal policies with such impunity. Its a real shame that given the progress they have made that they cannot let go of some of the tainted ideology. One has to wonder if they could have achieved what they have without upsetting the EU apple cart? Perhaps if they could tone down some of the nationalistic rhetoric Poland could be seen a model on how success can be achieved despite difficult global conditions. if another party where to come to power in the future would they have the stomach to withdraw any of the popular social policies that have been introduced so far? I think and hope not, and that surly has to be conveyed to the electorate for anyone to pose a real challenge. In Poland there is prosperity and freedom right now. People feel save and free. No more “trash jobs” and desperate mass migration to the west. Only a small “elite” which hides its criminal nature behind a shiny “liberal” camouflage, lost its freedom to exploit Poles and Poland. See “afera reprywatyzacyjna” and Polish “VAT miracle”. a threat to womens rights in Poland is what I laugh at most. When one look at the map of “women violence” Poland is the most safest place in Europe. Probably because of strong cult of st. Mary (mother of God) women are treated in Poland with much bigger respect then in other countries. Therefore Islam stands contrary to our habits. True that abortionists are not that welcomed in Poland as in western countries but lefties propaganda is still able to organize up to 60 000 people accross Poland to “stand-up” agains pro-life. It’s loud but I’m sure that if referendum would be made, the abortion would be even more limited. What works is national socialism. Nationalism and socialism. Not the Nazi type that produced camps and went beyond its borders but a local one that respects the nation as an organic whole in the nationalism and some socialism while allowing capitalism and individualism too. This is what works in Japan, Korea and now, hopefully in Poland. In Germany this too was a vision of Bismarck. Israel had a similar founding vision. Soros’ and Popper’s open borders nonsense, however, is dangerous in that it negates everything – all bonds. In Soros’ version it negates democracy too since the push to get more migrants into the European countries rejects the anti-democratic nature of that goal.